Dr. Clamann's research focuses on how current and future technologies can help reduce human error on our roadways. 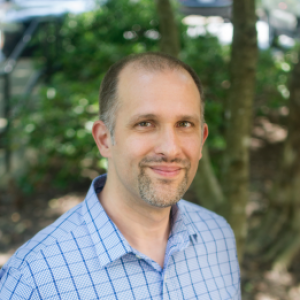 Michael Clamann is a Senior Human Factors Engineer with the UNC Highway Safety Research Center (HSRC) where he researches how technology can help reduce human error on our roadways. His areas of expertise include human-automation interaction and autonomous vehicle technology. Prior to arriving at HSRC, he spent more than 15 years in industry and academia studying how people can effectively team with highly automated and autonomous systems in a variety of domains including transportation, aerospace, defense and telecommunications. His previous project work in transportation includes identifying methods for autonomous vehicles to communicate with pedestrians, investigating ways to measure a driver’s mental workload and detect distraction while operating a highly automated vehicle, and measuring the effectiveness of using a mobile app to advise pedestrians about safe street crossings. He is an adjunct lecturer at Duke University where he teaches graduate and undergraduate courses in human factors, autonomous vehicles, and robotics and artificial intelligence policy. He also launched the robotics and artificial intelligence portal for the Duke’s Science Policy Tracking Program, SciPol, where he managed a team of student writers responsible for tracking and reporting on policy developments related to robotics and AI. Michael represents HSRC as a member of the North Carolina Department of Transportation’s Fully Autonomous Vehicle Committee (FAVC), where he leads the Autonomous Vehicle Research Group. He previously provided testimony to the National Highway Traffic Safety Administration (NHTSA) on the Federal Automated Vehicles Policy. Michael received a Ph.D. in Industrial and Systems Engineering with a Psychology minor at North Carolina State University in 2014. He received a M.I.E. in Industrial and Systems Engineering and a M.S. in Experimental Psychology from North Carolina State University in 2011 and 2002, respectively. He is a Certified Human Factors Professional (CHFP) and a member of the Human Factors and Ergonomics Society (HFES). A project involving autonomous cars at NC State could move driverless cars closer to reality. Will Autonomous Cars Make Roads Safer for Pedestrians? Domino's and Ford have started testing driverless-car pizza delivery in Ann Arbor. MCity will test a driverless shuttle around the University of Michigan’s North Campus starting this fall. No doubt about it, driverless cars are coming. And with that comes a new challenge: how to make those driverless cars safe for pedestrians. Right now, there are two ways to be safe crossing a road: Wait until no cars are close by, so there’s enough time to make it to the other side of the street – or communicate with oncoming drivers. As the number of pedestrian deaths on U.S. roads climbs, up 25 percent since 2010 to more than 5,000 people in 2015, the dawn of driverless cars offers the promise of improving that sad safety record. Driverless cars. Drones flying through the sky. Years ago, they would have sounded like details out of a science fiction novel, but they’re reality. When drivers head to work or to the store, they subconsciously make hundreds of decisions related to driving laws and safety: Should they swerve to avoid an object in the road? Should they speed up to catch a yellow light? With driverless cars on the way, programmers are charged with figuring out how to replicate a human’s driving logic and anticipate what decisions a car should make in countless scenarios. In civil aviation, automation has reduced workload and stress for pilots, while making flying one of the safest ways to travel. Can these safety lessons apply to autonomous cars – especially with regard to how we as drivers will interact with them? We spoke to a human factors expert to get answers. A computer keyboard, at its most reliable, is barely noticeable to the person using it. It is designed to be felt, heard, and mostly ignored. Once you’re comfortable with the thing, you usually aren’t focused on the keys you’re pressing, or the gentle clack-clacking sound those keys makes. Instead, you’re immersed in whatever is happening on the screen. How does a robot use a lift? It sounds like the lead-in to a bad joke (punchline: "very carefully"). But it's WIRED's first question upon meeting Adrian Canoso, the design lead and co-founder of the robotics startup Savioke, over breakfast at the Crowne Plaza Hotel in San Jose, California. Will Laser-Guided Autonomous Cars Solve Light Pollution? On April 11, Ford released a video of “Project Nightonomy,” its nighttime autonomous vehicle tests. The green-tinted night vision video shows a prototype Ford Fusion navigating the company’s Arizona test track while only using LIDAR. The Fusion handles the test with ease, navigating the dark desert night as effortlessly as it handles a well-lit road. Big Question: Is America Ready For Driverless Cars? Like it or not, cars will soon be driving themselves all over the U.S. While many new vehicles already have some autonomous features, a new Moody’s report predicts fully driverless cars could be a common option by 2030, standard on all new vehicles by 2035 and have near-universal adoption by 2055. Our guests of opposing perspectives weigh in on this week’s Big Question: Will self-driving cars be good or bad for America? MADISON, Wis.—Self-driving cars, if Google and automakers have their way, would already be on the road — with passengers as guinea pigs and no safety oversight in place. If that sounds like hyperbole, think again. High-tech and auto companies clearly prefer to let autonomous cars learn from their mistakes by driving more miles in the real world environment. The sooner those cars hit the road under minimum state and federal safety rules, the better for the corporate bottom line. One sunny day, I'm standing in a vast landscape of tall pines, green meadows and distant mountains. Looking up, I see blue sky overhead. Looking down, I see the forest floor beneath my shoes. A tall man stands nearby, wearing strange glasses and brandishing a wand like a wizard. Another human figure appears on the horizon. She grows larger and accelerates as she strides over the meadow, as if she had spotted me and had something urgent to say. When it becomes clear that she isn't going to stop, I try to duck aside too late. But instead of colliding, she passes right through me, like a ghost. Besides being a skilled chauffeur, psychologist, nurse, chef and maid, a mom also needs to be a weight lifter. At least, that's what I thought as I attempted to lift my babies in car seats from the car into my apartment, a store or playground some years ago. My wrist ached, and it didn't help that I was already exhausted from giving birth and being sleep deprived. Connected and Autonomous Vehicles: Public Policy Implications and North Carolina’s Role. Senior Safety and Mobility in the Age of Automation. A survey course investigating the intersection between people and technology to understand how design can influence performance, safety and user satisfaction. Topics include design principles; usability and user experience concepts; and an overview of human strengths and limitations that influence interactions with technology. Basic concepts of human factors and their application to design of human-machine systems. Consideration of human cognitive and physical capabilities and limitations in design for human performance and safety.